Philips unveils 2015 soundbars and soundbases | What Hi-Fi? Philips has introduced four new soundbars and two new soundbases as part of its 2015 home cinema range. Features across the range include aptX Bluetooth, NFC and proprietary audio technology. Starting with soundbars, and the Fidelio B5 (pictured above). It’s the successor to the award-winning Fidelio HTL9100 and sits at the top of Philips’ soundbar range. Like the 9100, the B5 can be used as a single soundbar unit, or a 5.1 system thanks to the detachable, battery-powered speakers on either end. Both the main section of soundbar and the individual speakers, feature built-in Bluetooth. This means the detachable sections can also double up as portable wireless ones, with each one boasting a battery life of around five hours. When they're used as part of the wireless surround system, you should get around ten hours use. The Philips Fidelio B5 is available now for £600. Like the B5, it too comes with aptX Bluetooth and a wireless subwoofer in tow. The HTL7140 is available now for £450. 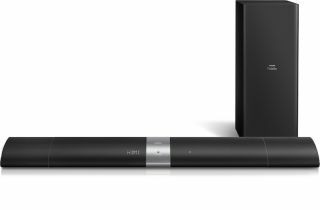 Dropping down a size, the HTL6140 is Philips’ slimmest soundbar, and comprises six, 2in woofers, two soft dome tweeters and a wireless subwoofer. It supports Dolby Digital virtual surround, DTS surround as well as aptX Bluetooth with NFC. It’s available now for £300. Finally, the HTL5145 is a slight update to the Award-winning HTL5140. The only change is that the new version comes with a slimmer, more powerful subwoofer. Philips says it delivers “supreme bass performance in an incredibly thin 83mm package”, and is available now for £280. Moving onto a new area for Philips: soundstages, aka soundbases. The ultra-slim XS1 (pictured) is the first of the new range. It’s a 3.1 channel system, with front and side firing drivers and a wireless subwoofer. The XS1 is compatible with Dolby Digital and DTS Surround encoding, and can support TVs up to 65in. It’s available now, with aptX Bluetooth, for £400. Like some of the other new models, the HTL5130 has a dedicated centre channel speaker, but opts for a built-in subwoofer, as opposed to a wireless one. It’s available now for £230.